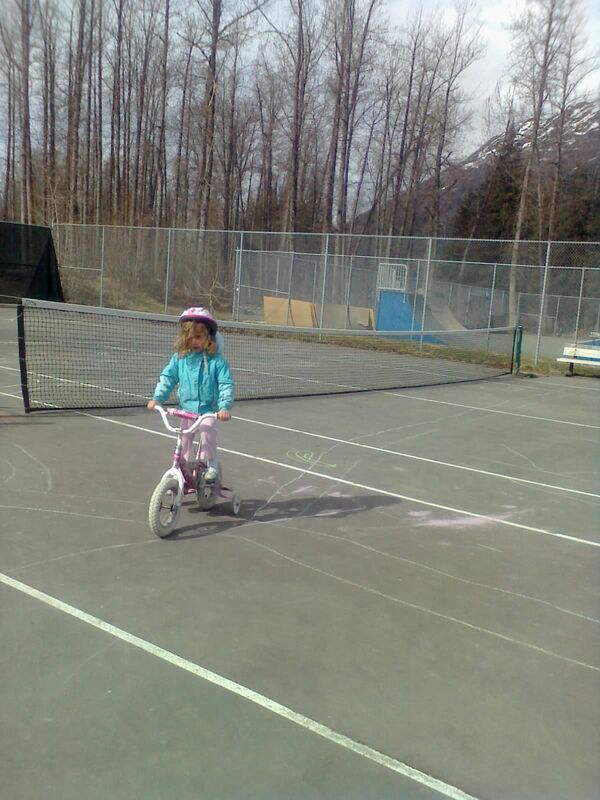 Those words were shouted time and time again as we went down to the tennis courts to practice riding bikes again today. Our youngest girls just got “big girl” bikes in the past couple weeks or so. They must be just about the smallest two-wheeled bikes one can have. They were hand-me-downs and are now complete with training wheels. 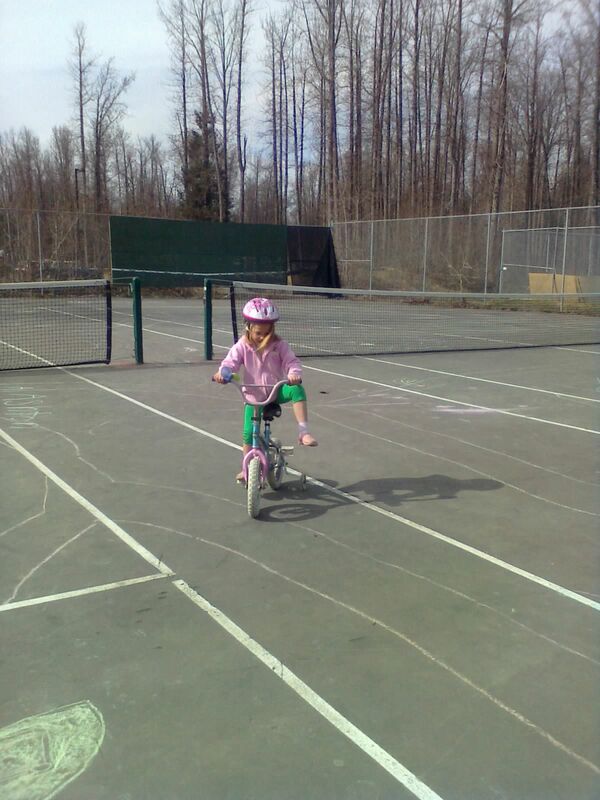 Learning to ride a bike for the first time is an adventure…one I’m ten years removed from with our older girls. Yes, there are falls every once in a while. Yes, there are tears. Yes, it can be be frustrating. And, yes, it can be scary for both parent and child. Within the last few days our girls have gotten comfortable enough on their bikes that they feel up to doing “tricks.” So, as they ride they take their hands off the handlebars…or they stand up on the pedals…or they put their feet off to the side. Each new move is met with “Daddy, look at me.” And I look. And I smile. Riding a bike may be old hat to me, but I need to remember that it’s completely “new hat” to them. Even with the training wheels on, it’s an exciting moment for them when they take their feet off or make a sharp turn or go around in circles or go real fast. As far as they are concerned, they are being very brave and adventurous. They are testing the limits. They are pushing the boundaries. And they want me to look at them and acknowledge their wonderful accomplishments. And, yet, attention is what they crave. And, it’s what they need. It lets them know that I’m invested in them. It lets them know that I love and care for them. It lets them know that they are important to me. And, hey, these really are big steps for a 4 year old. So often our kids just want us to “look” at them. They want us to recognize their accomplishments and also their pains. They want us to, not make them FEEL as if they are important, but to recognize that they ARE important as well. This can be a problem in the church, where, often, children are to be seen and not heard…if they are to be seen at all. We spend so much time an energy trying to keep them quiet or remove them from the “big people” worship that it can be easy for them to think that no one is looking at them and no one is hearing what it is that they have to say…or have to offer. At Girdwood Chapel, I’ve tried to make it so kids feel like they are involved in worship. It does come through during communion and the prominent role they can play there, with kids participating fully with the adults. But, more, I think it comes through during our prayer time, our “Joys and Concerns.” For it’s here that kids really are on the same playing field as their parents and the other adults in the congregation. They get to offer up their joys and concerns amongst the gathered body. This is not a special “Children’s Time” set aside for them. It’s not “Children’s Church” or their own Sunday School. And so we’ll hear about the usual joys and concerns that adults bring each week, peppered with prayers for “sick goldfish” or “4th Birthdays” or “boo boos on fingers.” And yet, those are the real joys and concerns of some of our younger attendees. And by lifting them up and having them recognized by the larger church body, we let them know that they are important and loved and that we recognize that their hurts and happiness are real. What are other ways our congregation could “look at” and recognize the children we know and care about? This entry was posted in Family, Parenting, Personal, Prayer by jimdoepken. Bookmark the permalink. >This is SO excellent, Jim!